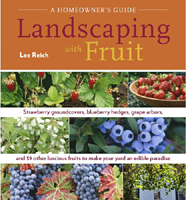 A book to rethink landscaping and fruit growing. Use certain temperate zone fruit trees, vines, shrubs, and groundcovers to beautify the landscape and, at the same time, provide tasty fruits for eating. The focus here is on so-called dessert fruits, delectable fruits that can be enjoyed right off the plants. Most people don't expect to need to—and don't have to—perform detailed annual pruning or pest control on their landscape plants. Fruit suggested in this book are those that can be held to these same low-maintenance standards. Learn how to optimize growing conditions and reap bountiful harvests while enjoying your scenery. There is an additional charge for shipping: $3.00 for the first book, plus $1 for each additional book. Buyers in New York State must also pay sales tax. These charges will be added during checkout. For international orders, please contact me for shipping information. "Beautiful photos, stellar information, and buckets of inspiration!"